The above copper farthing token measures 15.9 mm and weighs 0.76 grams. It was issued in the name of Daniel Burry of Cousin Lane, Dowgate. Cousin Lane was located in the Dowgate Ward of the city and ran off the south side of Thames Street down to a slip way and wharf on the River Thames. 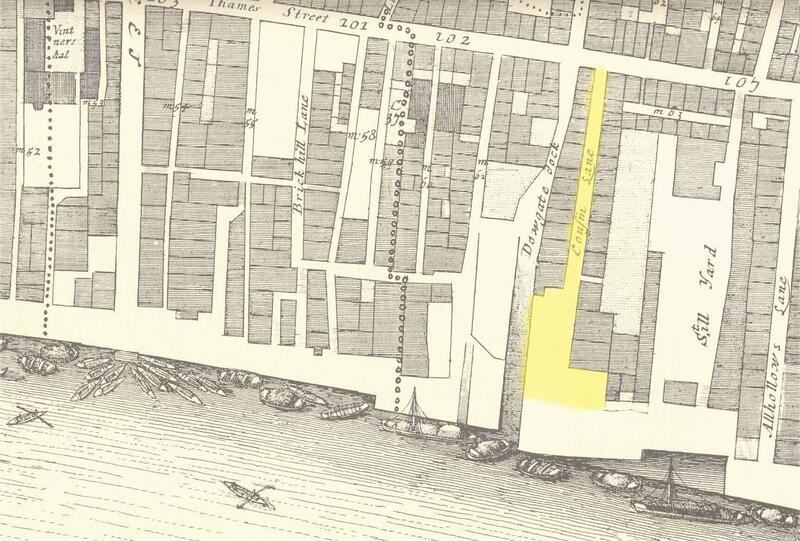 This lane formed the western boundary of Steelyard (or Steel / Still Yard) and was located in an area containing several warehouses and goods storage yards all of which backed onto the north bank of the River Thames. Obverse: .DAN . BURRY WOODMVNGR , around twisted wire inner circle, depiction of four barred gate within. On stylistic grounds this farthing token appears to date from the mid 1650s t0 the early 1660s. Daniel Burry (or possibly Berry) was a woodmunger, or domestic fuel (i.e. wood and coal) salesman. He probably traded at the sign of the gate in the terrace row which ran along Cousin Lane and backed onto Dowgate Dock. The properties on the eastern side of Cousin lane backed onto Steel Yard. In the 1662 Hearth Tax returns his property is listed as having 5 hearths. 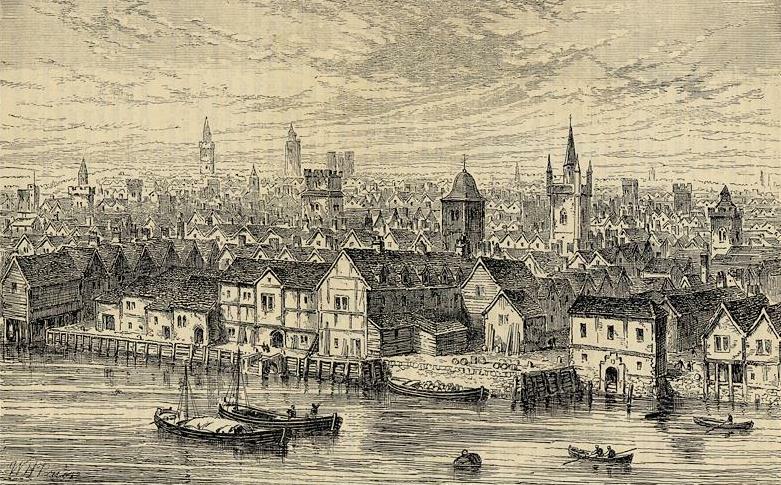 On 2nd September 1666 this area of the city was destroyed during the first morning of the Great Fire of London. In the first of his famous diary entries (reproduced in part below) which document the progress of the fire Samuel Pepys described its progress that first morning and how he witnessed it engulf the warehouses and storage yards in the vicinity of Steel Yard. These contained a plethora of combustible goods including, brandy and spirits, rope and cord, tallow and wax, wool and cloth, pitch and tar plus coal and (in the case of our particular token issuer) wood. The neighbourhood of Steel Yard on the north bank of the River Thames, London. (c.1540). The last four of these foundations were surveyed by the famous Robert Hooke under his post Great Fire role of Surveyor of the City of London. No further information has yet come to light regarding Daniel Burry or his wife (possibly Margaret or Mary) or business post the Great Fire although the present writer has been discovered a burial register entry, dated 23rd February 1698, for a Daniel Burry in the parish registers of All-Hallows-the-Great. This church was situated on Thames Street just east of Steel Yard. It was one of the many parish churches re-built by Sir Christopher Wren after the Great Fire. This church would almost certainly have been that to which Daniel Burry, the woodmunger of Cousin Lane from the 1650s and 60s, would have attended.